Let the countdown 'til Christmas continue with DAY 11! The faux Christmas sweater is back - and it's better (and uglier) than ever. 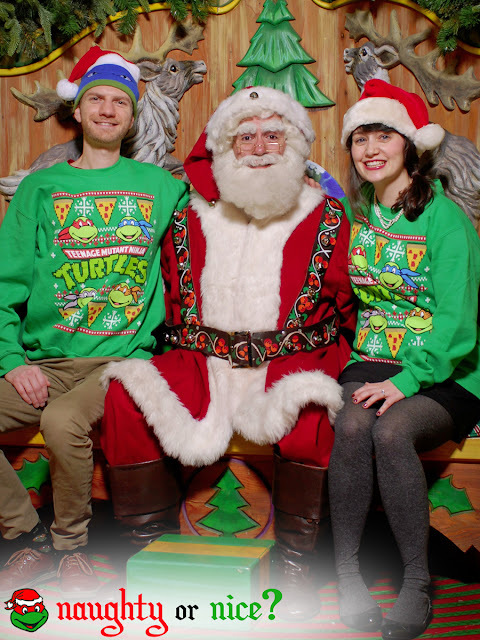 The faux Christmas sweater has become a holiday mainstay for TMNT fans. Each snowy season, 80sTees.com presents the gift of mutated, absurd fashion. Although the design changes with each passing year, the fun-fueled legacy of ugliness remains strong. The big win here is the color. In past years, we've seen gray and red faux sweater releases, but green finally makes its holiday debut. In a season riddled with red and green fashion, the faux sweater's loud color is still an attention-getter. When it's in the room, no one can look away. The color, the design, the ugliness - it's unstoppable. Even your sweet Aunt Tilly, along with her fancy broach, will be jealous of its attention. 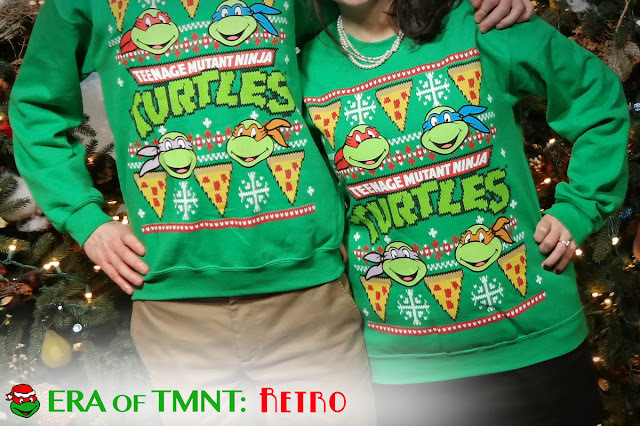 The faux Christmas sweater of 2015 is a retro beauty catered to TMNT-loving adults. It's classic cartoon design boasts festive snowflakes and fun pizza. For younger fans, 80sTees.com sells a similar version in kids sizes - allowing Turtle-lovers of all ages to strut their ugly stuff. Joy to the sewers! Does the the faux ugly sweater make a good gift? I'm not the only one who is impressed with the latest offering from 80sTees.com. My good old pal, Santa Claus, had plenty of comments about the green garments. High up, on the 8th floor of New York City's famous Macy's store, jolly Saint Nick dropped his North Pole opinion. "Oh, the Teenage Mutant Ninja Turtles - my favorite!" he said with a sparkle in his eye. He then added, "I always adored Raphael." With that, he ho ho ho'd us on our way. 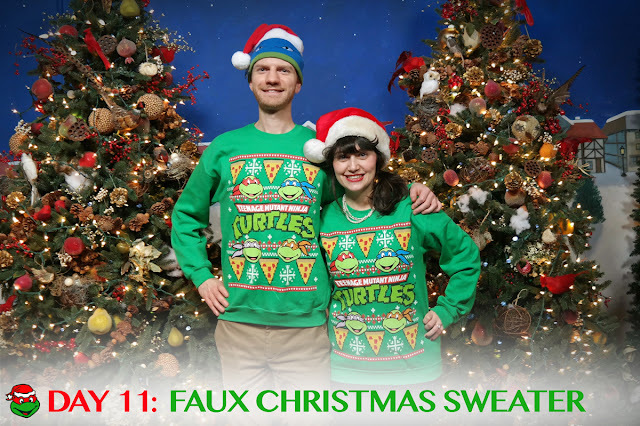 Thanks to the faux sweater, we now know Santa's favorite Turtle. It's a Christmas miracle. There's no better way to spend the holidays - dressed up, looking silly, and having fun. The Turtles do this on a daily basis. Get gaudy, ninja-style! Snag a faux ugly sweater for yourself at 80sTees.com. Use Discount code Preorder20 to score 20% off (only while it’s on pre-order). 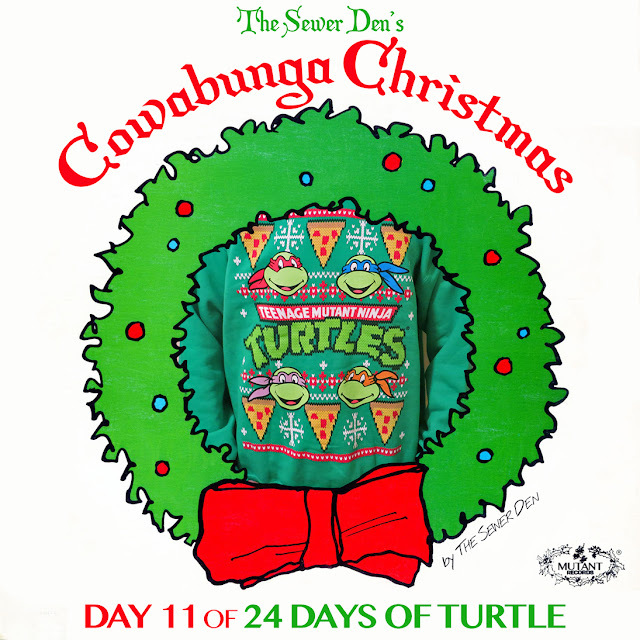 Check back tomorrow for DAY 12 of Cowabunga Christmas! Can't wait until then? Take a trip with the Ghost from Christmas Past to see what The Sewer Den put on display on December 11th in 2013 and 2014.